FILE - Security troops stand outside a polling station during the initial presidential elections in Bamako, Mali, July 29, 2018. 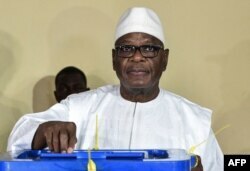 FILE - Mali's incumbent president, Ibrahim Boubacar Keita, votes in Bamako in the runoff election Aug. 12, 2018. 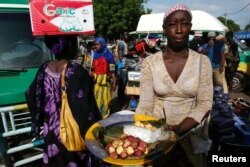 FILE - After winning second term in runoff, President Ibrahim Boubacar Keïta needs to build public confidence, observers say. FILE - Soldiers patrol after election-related unrest, in which protesters fired shots into the air and torched vehicles in Timbuktu, Mali, July 25, 2018.